This soup manages to be rich and creamy, and somehow also cleansing and soothing—perfect Post-Super Bowl fare. Whether you’re still celebrating the Giants’ big win, or quietly mourning the Pats’ fall from grace (like I am), you still need to eat—preferably something quick and healthy. Add cubed firm tofu, a handful of plump shrimp or cooked, shredded chicken, if you want to add a little protein. Add the garlic, ginger, onion and lime zest and cook, stirring occasionally, for about 2 minutes, until very fragrant. Stir in the lime juice, broth, coconut milk, soy sauce and brown sugar. Cover and bring to a light boil. Add the sweet potatoes, cover and cook for 12-14 minutes, until the sweet potatoes are fork-tender. 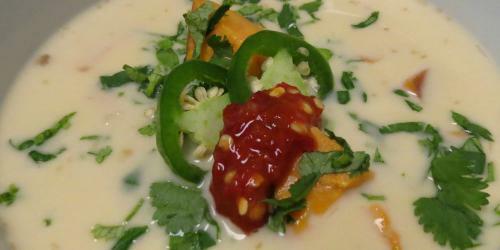 Ladle the hot soup into bowls and serve, garnished with the cilantro and the jalapeño and chili sauce, if desired. This looks yummy, when I saw it I went right home and made something similar – thanks for sharing! Made for dinner last night. Awesome-especially with a little garlic chili sauce!!! Delicious and easy! Added shredded chicken and we loved it! Can’t wait to eat the left overs tonight! This soup was amazing. I pureed everything and it was the prettiest color. ALL Games with Gold titles for Xbox 360 will be playable on Xbox One,With Xbox One Backward Compatibility, play multiplayer with your friends no matter which console they’re on and enjoy Xbox 360 games with the advanced features of your Xbox One available on this website. Nice article,I loved it.Thanks for sharing and keep sharing. Get a ERP software for you small business.For more details contact us. Nice post. I learn something totally new and challenging on articles I stumbleupon each day. It will always be exciting to read simple things content material from their authors and practice something of their web-sites. Good post. I find out something totally new and difficult on personal blogs I stumbleupon day-to-day. It’s always intriguing to read simple things content from the writers and practice something from their sites. Good post. I find out something new and challenging on websites I stumbleupon everyday. It’s always useful to learn material from other writers and use a little from their web pages. Good post. I learn something totally new and challenging on webpages I stumbleupon day to day. It’s always interesting to read through information from the other authors and use a little something from their websites. Nice post. I find out something new and difficult on articles I stumbleupon day to day. It’s always useful to read simple things written content from the freelance writers and use a little of their online sites. Good read. I find out something totally new and difficult on webpages I stumbleupon everyday. It’s always intriguing you just read material posted by copy writers and use a little from other online sites. Good read. I learn something totally new and challenging on sites I stumbleupon daily. It’s always interesting you just read information from the other writers and use something from their websites. Good post. I find out something new and challenging on personal blogs I stumbleupon every day. It will always be fascinating to read content from their author`s and use a little something from their websites. Nice post. I find out something totally new and challenging on personal blogs I stumbleupon every day. It’s always useful to read information posted by copy writers and use a little something of their online sites. Good post. I find out something totally new and difficult on blogs I stumbleupon day to day. It will always be helpful to study articles from other writers and use a little of their online sites. Good read. I find out something new and challenging on sites I stumbleupon every day. It will always be interesting to learn articles from the internet writers and use something from their web pages. Good read. I find out something new and challenging on webpages I stumbleupon regular. It’s always helpful to learn content material from other authors and use something from their internet sites. Nice post. I learn something totally new and challenging on websites I stumbleupon daily. It will always be intriguing to study content from their authors and use something from their online websites. Good post. I learn something new and challenging on webpages I stumbleupon daily. It will always be interesting you just read content material from their internet writers and use a little from other web-sites. Good read. I find out something new and difficult on webpages I stumbleupon day-to-day. It’s always intriguing to read through content material from their internet writers and practice a little from their websites. Nice post. I learn something totally new and challenging on webpages I stumbleupon regular. It’s always helpful to study written content from the other editors and use a little something of their web-sites. Nice post. I find out something totally new and difficult on sites I stumbleupon day-to-day. It will always be intriguing to read simple things material from all other internet writers and practice a little from their online sites. Good post. I find out something totally new and challenging on sites I stumbleupon day-to-day. It will always be fascinating to learn material from the other copy writers and practice a little from other online websites.